At Ottobock, it is our mission to help people maintain or regain their freedom of movement; and we have applied this focus to knee osteoarthritis with the introduction of the Agilium Reactive. Specially designed strap ends are arthritis friendly. The tabs can easily be found for brace application and removal, making it easier than tying your shoes. Flexible cuffs conform to your leg shape and adjust to your changing leg shape during activities. The Agilium Reactive uses a lateral hinge design, which places the mechanics of the brace on the outside of the leg regardless of your diagnosis (medial or lateral osteoarthritis). This placement on the outside of the leg avoids interference with the opposing leg and can be easier to apply. Your knee brace should fit your lifestyle not restrict it. The auto-adaptive cuffs on the Agilium Reactive conform and move with your body while you walk, run, or dance! The Agilium Reactive makes sure you get a perfect fit, every time, for every activity. At less than a pound, the Agilium Reactive is one of the lightest knee braces available. And, the Agilium Reactive is the lightest brace available for patients with severe knee osteoarthritis pain. 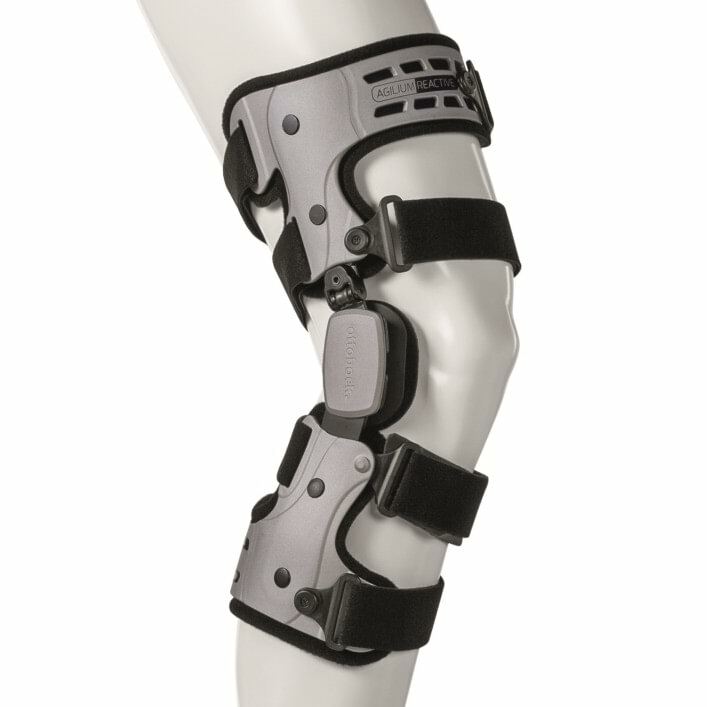 Many knee braces provide pain relief but restrict movement of the knee. The Agilium Reactive uses a lateral hinge design, which places the mechanics of the brace on the outside of the leg. This placement ensures the brace provides direct pain relief without interfering with the opposing leg during your activities. The simple application of Agilium Reactive makes it easier for you to quickly get the pain relief you need. Other knee braces require you to remove your shoes and step through the device, or they have straps that cross and create complexity. The Agilium Reactive has four simple straps.